Help! My Dental Crown in Murray Came Off! This may seem like a fairly obvious tip, but we are mentioning it because it is essential. Carefully take the dental crown out of your mouth. If you accidentally swallow it, you will have some extra issues that aren’t very pleasant. Inspect the crown and your tooth in the mirror. If there is damage to either, Dr. Blackwood and his team of professionals will need that information. We will schedule you an appointment ASAP and advise you on whether you should use temporary cement to re-attach the dental crown in Murray until you can get into Salt Lake Dental Care – Clint Blackwood DDS and have it permanently re-cemented. Use a toothbrush to very carefully clean the crown and the unprotected partial tooth. Do not put too much pressure on the tooth and be as gentle as possible. You don’t want to cause any damage to the tooth. 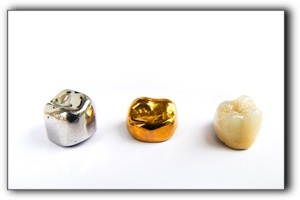 While waiting for the crown to be re-cemented, forego substances that are chewy, sticky, or crunchy. Avoid snacks, candy, chips, and gum. Try to eat things that are soft or that are mostly liquid. We hope this post has been informative for you. If you would like more information on taking care of your dental crown in Murray, give us a call at 801-938-8855. At Salt Lake Dental Care, our practice offers a variety of dental services such as dental implants, dental veneers, and wisdom teeth extraction. We look forward to hearing from you.